BLOG OUT LOUD + DWR NEXT WEEK!!!! 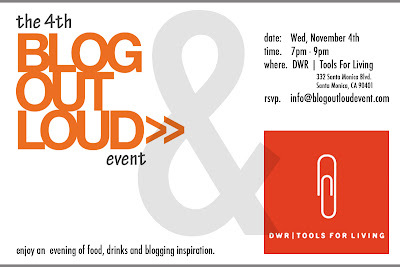 If you are looking for some serious blogging inspiration and know-how, please join us at the 4th Blog Out Loud event on Wednesday, Nov 4, at DWR in Santa Monica CA 7pm - 9pm. We are teaming up with the amazing DWR | Tools For Living shop in LA for the free event. 1 Response to "BLOG OUT LOUD + DWR NEXT WEEK!!! !